A wonderful, quick and easy dish to make for the family! Cook the rice noodles as per pack instructions, drain and set aside in a bowl. Preheat the frying pan on a medium heat until warm then place the salmon skin side down on the pan. Cook for 5 min until golden brown, then turn the salmon over and continue to cook on a medium low heat for 8 minutes, squeeze the lemon juice over the pan just before serving. To serve, drizzle some pesto over the noodles, then divide between four serving plates. 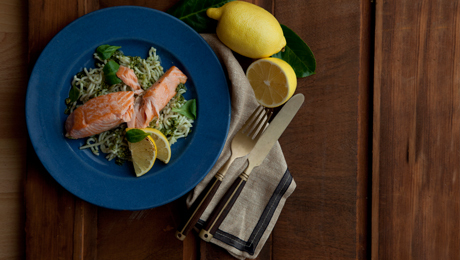 Place the salmon onto the noodles and add a further serving of pesto. Season if required.